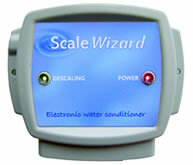 Scale Wizard comes from an innovative company of twenty years standing which has invested in solutions that offer real benefits for consumers around the home and sells directly to the public. All of the products are manufactured to exacting standards and backed by technical support staff offering customer service that is second to none. This has enabled Scale Wizard to have both a long life guarantee and a full refund, without question, should the product not meet the customers' full expectations. Scale Wizard will continue to offer a competitively priced product range by using the latest technology to reduce costs - without compromising on the high quality standards we set ourselves.